Wish to Reach Over 3 Billion People and customize your Audience? The internet platform crawling with opportunities all year round. All we have got to do is to systematically tap into the resources by implementing and deploying the right mechanisms to create a user-friendly atomsphere for your business to thrive in. Social media sites such as Facebook, Instagram, Pinterest, Snapchat, LinkedIn, Twitter and many others constitute a powerful weapon waiting to be unleashed – its users. 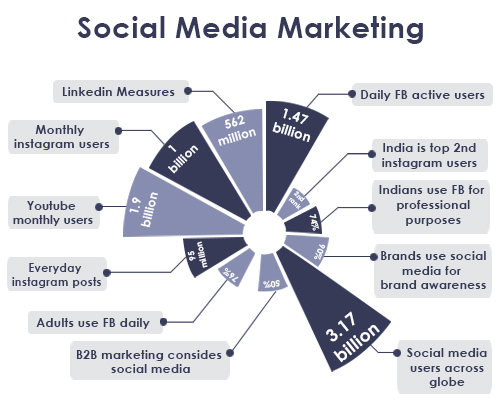 SMM mechanisms such as social media audit and analysis and content development are just a few ways in which you can utilise the social media following to up your game in the market. Social media has the power of changing the way your business functions, get started today! About 3.03 billion people are on social media around the globe, so make use it wisely and make your presence felt. If you would like to understand where you stand in the market then get a free report on your user engagement. Get a simple website audit done today and learn numerous ways to improve your website performance.. Conducting a social media audit allows you to collect and analyze detailed data from all of your social media accounts. We look closely at your activity, results, audience, and financial investments including money spent on advertisements. To get a clear picture, every aspect of your social media marketing is to be accounted for. Thus, we take utmost care in auditing your social media presence and analyzing it. With so many budding businesses making their presence felt on social media, it is important to stand out of the crowd. To make sure that your social media marketing mechanisms are effective, we offer content development and creative designing services that will make your brand stand out. We employ the most creative of minds to ensure that you are provided with high quality work inclusive of fresh content and distinct designs that will not go unnoticed by your target audience. Simply deploying various SMM mechanisms is not enough. The process begins from auditing your existing social media presence and then managing your social media which includes monitoring posts, likes, comments and messages. Regular checks need to be conducted so as to systematically make required changes. We manage your social media presence for you and help you build your brand of various platforms. With massive number of users present across social media such as Facebook, Instagram, LinkedIn, etc. creating a platform to engage interested consumers, it is imperative that two wonderful weapons – social media and advertising are put together to pull in prospective and interested clients and consumers. Social media advertising is relatively less expensive than traditional advertising methods and has guaranteed returns with the right audience is targeted. Social Media advertising stands with the concept of ‘every penny counts’. Tapping into the resource and using social media to power lead generation, social selling, sales nurturing, and brand engagement is one way to use social media to the business’s advantage. And the cherry on top is that social media lead generation is cost effective, and produces genuine results without the help of middlemen: Social media marketing has reduced costs for 45% of businesses while increasing revenue for 24% of businesses. Our job does not end with optimising your website or application, we go a step ahead and tap into the resources that arise from implementing Social Media Marketing (SMM) mechanisms. We provide you with regular reports and analysis based on your engagement so as to keep you in the loop. We care for your business too!